William Allen is an Analyst at Metropolitan Partners Group. His responsibilities include deal execution and portfolio analytics. 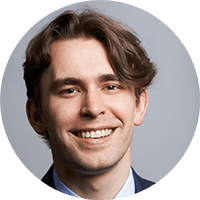 Prior to joining Metropolitan in 2018, William was a Consultant for Wicked Start Innovation, an incubator for emerging food and beverage ventures, where he worked with start-up companies by creating go-to-market strategies, developing financial statements and models, and identifying potential investors for them. William graduated from the University of North Carolina with a B.A. in economics. He is Series 7 and Series 66 licensed.